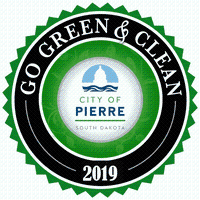 The City of Pierre is excited to kick off the 10th year of the Go Green & Clean Campaign! Each Spring, the City of Pierre asks for volunteers in the community to assist with activities and events that help clean up our many public lands, parks, road ditches and other areas of need to prepare the community for the visitors and guests that travel to Pierre. The campaign originated by Mayor Laurie Gill in 2010 has grown to where over 200 volunteers from 30+ organizations participate annually. April 22 - May 11 - "Spring Clean Up"